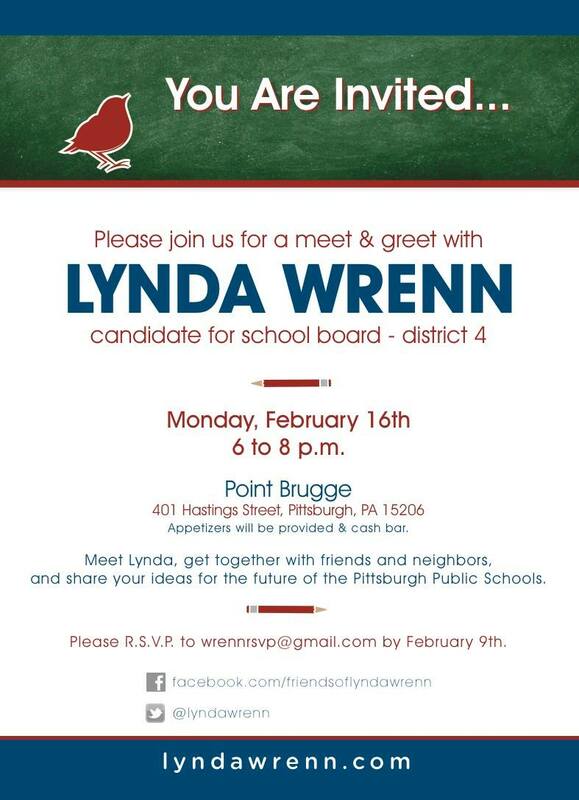 Sorry for the long radio silence – I’ve been working to help launch Ms. Lynda Wrenn’s campaign for the Pittsburgh school board. Lynda is a fantastic candidate in District 4 (in the city’s East End), where Mr. Bill Isler has announced he is retiring at the end of this year. I’m excited about her vision for our students and schools. Even if you don’t live in the district, this is a crucial race to get involved in: among other important decisions, the new board will be choosing the next Superintendent! Four of the nine school board director positions are up for election this year, and at least two of those races will be contested with multiple candidates. Hang onto your hats, this primary is going to be a fun ride! You can RSVP for the launch party and get more information on the Facebook event page. I’m running for school board because I want every child in the city’s school district to have the opportunity to excel to the best of her or his ability. I believe that investing in our public schools is in the best interest of our children, our neighborhoods and our city. A city is only as good as its school district. Exciting things are ahead for Pittsburgh and I will work hard to make sure that the school district is moving forward and providing the best that it can for the children of our city. Lynda has a Masters in Teaching from Chatham University and did her student teaching right here in Pittsburgh Public Schools. She has also worked in marketing and advertising as well as in childhood obesity research (which took her into Pittsburgh’s middle schools). And she understands finance: her undergraduate degree is in Economics and she also worked in the office of the Financial Vice President and Treasurer at Radcliffe College (Harvard University) where she was responsible for fiscal reporting. Many people in District 4 already know Lynda as an extremely engaged community member: she has served as a president of the Point Breeze community organization, and on committees for the Pittsburgh Parks Conservancy, Chatham Baroque, the Kelly-Strayhorn Theater, and the National Council of Jewish Women. She currently serves as an Allegheny County Democratic Committeewoman in the 14th Ward. I hope you will join Lynda at her launch party and take the opportunity to get to know her – and to get involved in this important campaign for the future of our city. A heartening moment in the dark landscape that is currently public ed. Nice to know you have an equivalent to Philly’s Helen Gym, who launched her campaign for city council yesterday. Here’s to bringing smart engaged advocates to the legislative table! Lynda is a fantastic candidate. She was my student at Chatham and I’ve taught two of her children at Allderdice. She will be a great voice for public education.